President Obama has repeatedly invoked his vision of a green economy as a tool for helping the U.S. lift itself out of recession and position itself as an economic powerhouse in a carbon-constrained future. The American Recovery and Reinvestment Act (ARRA) of 2009, the $787.2 billion stimulus package that Congress signed into law in 2009, was chock full of provisions to boost renewable energy, energy efficiency and environmental restoration initiatives. Examples include $4.5 billion to convert government buildings into high-performance green buildings, $8.4 billion for investments in public transportation, and tens of billions of dollars more for research into new technologies to amplify existing efforts. ARRA also earmark $11 billion for the implementation of the “smart grid,” a new approach to power distribution that will bring more clean energy sources into the mix and promote energy efficiency. Infusing such huge amounts of cash into sustainability-oriented projects is one way the Obama administration hopes to “green” the U.S. economy while simultaneously pulling the country out of recession. “To truly transform our economy, protect our security, and save our planet from the ravages of climate change, we need to ultimately make clean, renewable energy the profitable kind of energy,” Obama told Congress a few months ago. 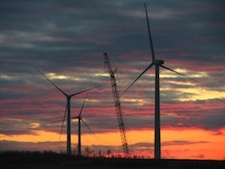 Of course, Americans aren’t the only ones bent on building a green economy. During the 1980s and 1990s, while the American government was largely asleep at the wheel on environmental issues, countries such as Denmark, Germany, Spain and Japan were already busy investing in wind and solar research and implementation. And while these nations’ ongoing efforts are nothing to sneeze at, economists point out that what is most needed is action on the part of the world’s fastest growing economies—China and India.